of our favorite bloggers to share the stunning decorations with the help of ProFlowers bouquets and centerpieces for Thanksgiving. of ideas for holiday inspiration. Now, let’s see how our bloggers celebrated their Thanksgiving. These are so beautiful and inviting, it almost makes us want to sit down for another Thanksgiving this weekend! Piera from Jolly Mom elevated the kids table into the table everyone wants to be at this Thanksgiving. Butcher paper, crayons and personalized mason jars complete with lids were on her table along with our Turkey Harvest Mum Centerpiece. She also shares some great tips for designing your own tablescape. Crissy from Parent Pretty designed her entire Thanksgiving table around our Seasonal Splendor Centerpiece. The beautiful fall colors of these arrangements sat on her beautifully prepared table. Amy from Marvelous Mommy designed her own fabulous DIY burlap table runner around several of our arrangements. Among other things, she added our lovely Deluxe Thanksgiving Bouquet to make her table pop with color. Catherine from Food, Family & Finds added fresh greenery to her festive table. She used our Thanksgiving Collection Centerpiece (28 inches) and we bet her house smelled amazing! Deanna from Mommy Gaga used flowers as a centerpiece and as inspiration for her tablescape. Along with her own items, she added a few of our Fall Cornucopias. Not to mention that this also would have made a perfect hostess gift. Megan from BonBon Rose Girls took the chic approach to her table. She used our Happy Harvest Centerpiece proudly displayed in the center of her table. She also paired the Deluxe Autumn Days bouquet on a side table with the delectable Handmade Thanksgiving Turkey Cake Pops. Crystal from Simply Being Mommy used our Radiant Fall Table Runner among other things to make her table look wonderful. She also shares some great tips to get you started on your own tablescape. Kim from Sand & Sisal brought those outside fall colors indoors this year with her tablescape. etched glass hurricane with a candle in the middle. a side table. We love her ideas! our Magnolia table runner on her chandelier and the Magnolia Table Runner on her table. Her Thanksgiving table was nothing short of amazing. Molly from Go Mom (and our resident organizer) went with simple elegance for her table. She used our Autumn Roses truly proving that roses are in season and in fashion all year long. we ate Thanksgiving at her house. Emilie from Oh My Sugar High gave us a Thanksgiving by candlelight. She used our Thanksgiving Collection 20 Inch Centerpiece that comes complete with candles. Now that Christmas is just around the corner, order your flowers or items now to create your perfect holiday centerpiece. If you are the guest rather than host this year, bring your favorite bouquet. Any host would welcome a beautiful bouquet. 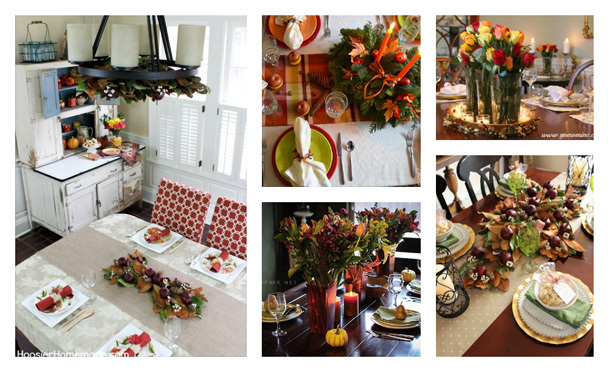 Share some pictures of your Thanksgiving tablescape on Twitter, Facebook or Google+ along with the #PFDecorates hashtag and we might just send you flowers for your Christmas tablescape.